The apartment is on the top floor of a country house, with independent entrance and is equipped with private bathroom, two bedrooms with double beds, and a kitchen. 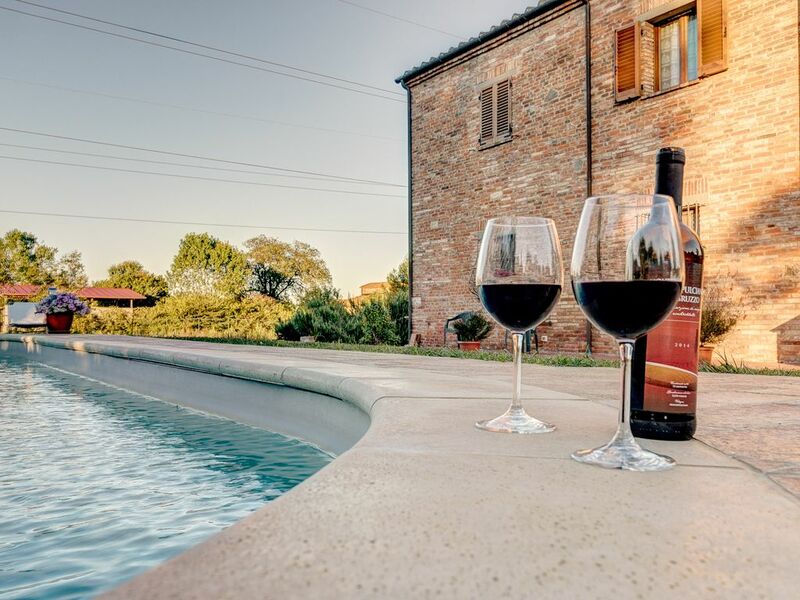 Ideal for families and couples who wish to relax in the large garden with barbecue or pool, but also for discover the art center and historic cities of Tuscany. The apartment is located in a strategic position, between the provinces of Siena and Arezzo, and offering easy access via the nearby highway. You can easily reach the center of Foiano, Bettolle Sinalunga just in 5 km, or the Valdichiana Outlet Village at just 2 km. The pool and the large garden equipped with barbecue. The owner or a collaborator will always be present for any need. Upon check-in you will receive a telephone number for emergencies. The house is located on ancient Etruscan site in the countryside of Foiano della Chiana, surrounded by corn crops, the place is characterized by the typical peasant dwellings connected by a network of narrow streets which gives access to farmlands. Chiana Valley is the valley that takes its name from the River Chiana, the ancient Clanis. Despite the stereotype of unhealthy and swampy area actually the valley is fertile and populated since Etruscan times, as evidenced by the presence of rich and big lucumonies (Arezzo, Cortona, Chiusi) and urban settlements along the hillside often fortified (Lucignano, Foiano Castiglion Fiorentino, Monte San Savino). The precious Etruscan remains are still visible in the local museums (Cortona, Foiano, Castiglione Fiorentino, closed) and in major national and international museums. Not far there is the train station, the bus stop, a bar, the A1 Highway, various supermarkets, fruits and vegetables shop at Km0. The house has two bedrooms with private bathroom and kitchen and is located in an ancient farmhouse that includes three apartments, 4000 square meters of garden and swimming pool shared with other apartments. The structure is immersed in the Chiana Valley, not far from main roads and the typical medieval villages, as well as from shopping center like Valdichiana OutletVillage. The area has a landscape bond and originally was an Etruscan site. The area is full of restaurants where you can taste the typical "Chianina" meat and taste red wine like Chianti, Nobile and Brunello etc... Not far there is the train station, the bus stop, a bar, the A1 Highway, various supermarkets, fruits and vegetables shop at Km0. Séjour très agréable, la maison est bien rénovée et très propre. Grande piscine très appréciée en août. Accueil chaleureux.